Being discoverable online should be an easy goal for local businesses but spots on the search engine results page are extremely competitive. With our White Label Local SEO packages, your clients will be at the top plus we’ll build a presence on all the local listings like Google My Business and Yelp. If anyone is searching for what your clients offer, we’ll make sure your clients are front and center. Simply subscribe to either a Plus, Platinum or Prime Local SEO Package. Put your business on the map and be discovered by your local community online. Our extensive local SEO services start with building a solid foundation for your online presence. the small but powerful changes needed to help search engines recognize the importance of a webpage. to cement your foundations on the Search Engine Results Page and enhance your branding online. Month-to-month, ongoing optimization of your webpages and more. Including on-page copy, to title tag optimization, meta descriptions and more. To maintain your rankings and to grow your traffic, we recommend building your online presence with natural link building. As we outreach, request and post on your behalf, save time and effort writing content for links and let us do the work for you. Build your trust online. 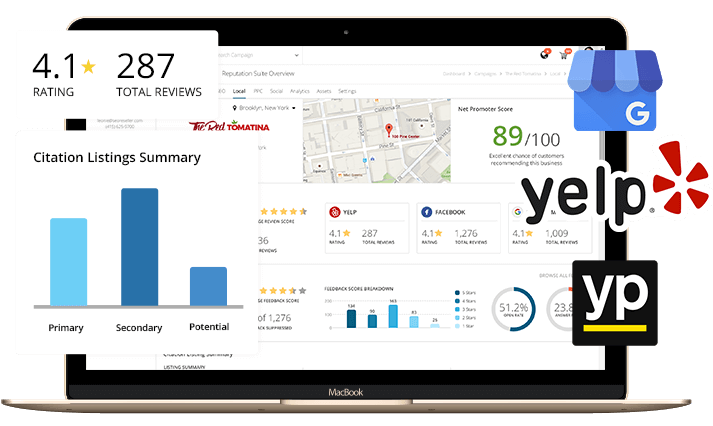 Our monthly local reputation management sends daily reports on reviews, comments and more in one neat centralized dashboard. Why Does Your Client Need a Local Search Engine Optimization? We use proven methodology-based solutions. Citation building is a critical step in maximizing your clients’ reputation online. Relevant backlinks are a close second. We accomplish both using only proven methodologies. We drive highly-targeted leads to their door. With a website optimized for local search and accurate listings, potential customers easily find your clients. Site traffic becomes foot traffic, manage all their leads in your dashboard. We improve their local ranking on Google. Following diligent keyword research, we target exactly what your potential customers are looking for to ensure that when they get to your website, they’re high-quality leads. We manage and control their online reputation. An online reputation is important for any business but it’s especially important for local businesses where one bad review can be catastrophic. We’ll help manage that reputation. Ready To Drive Traffic To Your Clients?